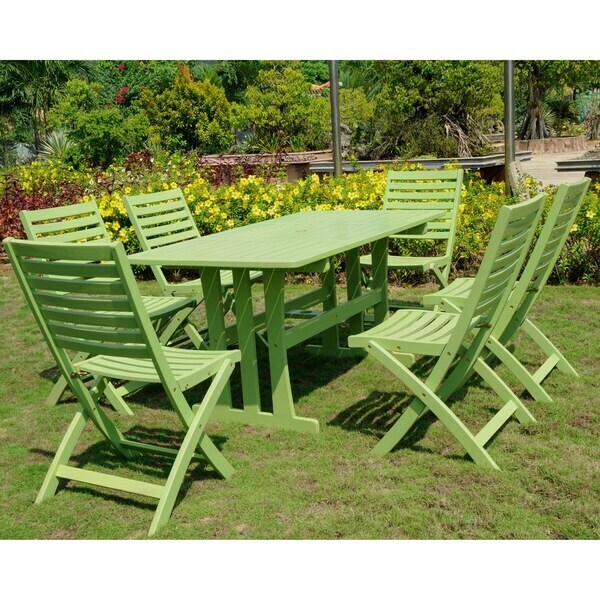 This outdoor dining set from International Caravan features a colored wood stain that is weather and UV resistant. It is constructed with acacia wood, a hardwood that is extremely durable and environmentally sustainable. Casual and comfortable for any outdoor living space, the six chairs included in this hardwood dining set fold up for easy storage in a garage or utility shed when not in use. I was afraid it would be cheap and uncomfortable, but i was WRONG! LOVE LOVE LOVE the soft green color, not as bold as the picture more soft mint green and the chairs are so comfy i don't even want cushions! and i love it so much, i just ordered a second set for the patio to sit right next to the first one in our outdoor dining area so that we can have basically one long table and 12 chairs! and for the price you just can't beat it!!!!! best price for a fantastic set! Love this dining set and it was really easy to put together. You never know when buying on line what exactly you're going to get. But I just love this outdoor set. I got the blue. It is easy to put together. Just the right look -- not bulky, doesn't take up the whole patio. Sent it back, Table is to small chairs seem flimsy and not painted properly and pieces damaged. Great Color though. Love this. It fits in our small enclosed sun room nicely!! Color is not TOO "limey". Not terrifically sturdy, but time will tell. Like. Easy to move around. "I want to use this table along with a 8' bench. In order to eat comfortable a need that the table approaches to the bench as much as possible. Can you tell me what is the distance between the exterior part of the legs and the edge of the table? Can you suggest any other outdoor rectangle or square table whose surface overhangs the legs or that has legs in the center? Thank you." Hello GEM, thank you for your inquiry. Unfortunately, the information you have requested is currently unavailable. You will receive an email notification once an answer is posted. Have a great day.